This PUBLIC ADVISORY No 2016/55 dated October 24, 2016 was released and published by the Philippine Consulate General in Jeddah. The Philippine Consulate of Jeddah reminds the public that the use of FAKE/FORGED documents submitted to Saudi Authorities is punishable by imprisonment and deportation. These include FAKE MARRIAGE CONTRACTS. 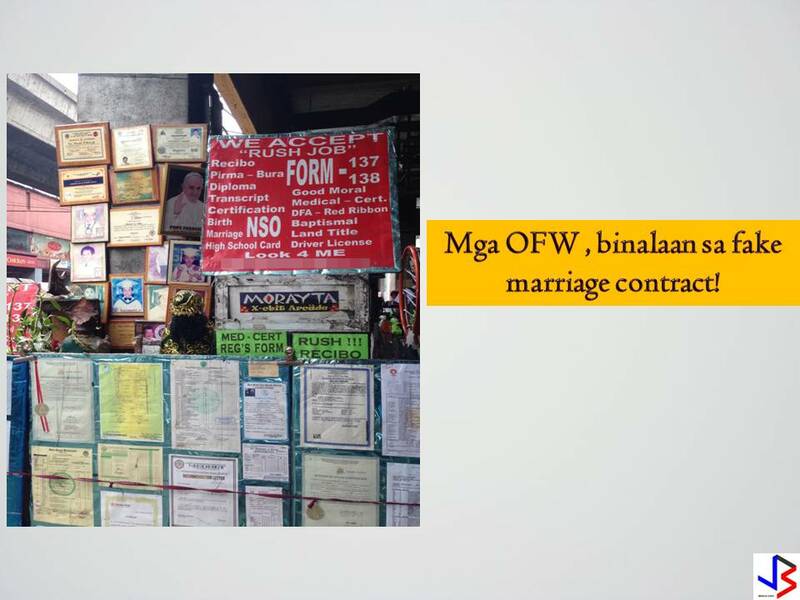 Saudi Authorities have been requesting the Consulate General , through the Ministry of Foreign Affairs, for VERIFICATION of the authenticity of marriage contracts involving Filipino nationals. The Consulate General only issues marriage contract for marriages between two Filipinos solemnized by the Consul General, Consul or Vice Consul within the Consulate. Consulate Officials do not solemnize a marriage between a Filipino and a foreign national. For marriages solemnized in the Philippines, the Consulate General authenticates the marriage certificate issued by the Philippines Statistics Authority (PSA) and authenticated (Red Ribbon) by the Department of Foreign Affairs. The public is reminded that all transactions regarding official documents are done only inside the Consulate General premises, except during Consular Mobile Services outside Jeddah. The Consulate General would like to further remind the public that FALSIFICATION of PUBLIC DOCUMENTS is a crime punishable under Philippine law.